This photo, tweeted out by SpaceX CEO Elon Musk on Jan. 29, 2015, shows personnel painting on the name of the company's first spaceport drone ship: "Just Read the Instructions." The robotic ships that serve as landing platforms for SpaceX rockets now have names that honor legendary sci-fi author Iain M. Banks. 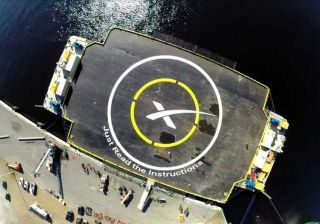 Late last month, SpaceX's billionaire founder and CEO Elon Musk announced that he had named the company's first spaceport drone ship "Just Read the Instructions." The second autonomous boat, which is under construction, will be called "Of Course I Still Love You," Musk added. Banks, who was born in Scotland, died of cancer in 2013 at age 59. "Just Read the Instructions" has already participated in one rocket-landing test, and has the battle scars to prove it. On Jan. 10, SpaceX tried to bring the first stage of its Falcon 9 rocket back for a soft landing on the ship, which was positioned in the Atlantic Ocean a couple of hundred miles off Florida. The bold and unprecedented maneuver — which came after the Falcon 9 had sent SpaceX's robotic Dragon capsule toward the International Space Station on a cargo run for NASA — nearly worked. The rocket stage succeeded in hitting the drone ship, but it came down too hard and exploded. "Close, but no cigar this time. Bodes well for the future tho," Musk tweeted on Jan. 10. He added: "Ship itself is fine. Some of the support equipment on the deck will need to be replaced..."
The Jan. 10 test was part of SpaceX's ongoing effort to develop fully and rapidly reusable rockets. Such technology could dramatically reduce the cost of spaceflight, Musk has said, perhaps making Mars colonization economically feasible. The unmanned drone ships provide a measure of safety at this stage, allowing SpaceX to conduct rocket-return tests far from any buildings or people. But the company eventually wants to bring its reusable rockets back on land, at or close to their launch sites.